Male 7½" - 8" Female 8" - 9"
In the wild, they are strong herbivores, preferring plants, although they will take in the occasional insects and worms. Semi-Terrestrial species living near wet forests, rain ponds and moist woodlands. Southern Nicaragua and northern Costa Rica. Rhinoclemmys pulcherrima manni are highly aquatic as hatchlings and while young, but become more land-based as they get older. Mature Rhinoclemmys pulcherrima manni frequent swimming areas, but spend most of their time on long. A large dry, land area needs to be provided for them to scamper about. UVB lighting and a heat lamp over the land area is required. A submersible heater is also recommended. Their swimming area needs to be relatively shallow, being deep enough to cover the top of the shell, plus about 1 inch. Filtration is a must for their water as they tend to pass waste more frequently in the water. Recommended size for a single adult Rhinoclemmys pulcherrima manni would be a 55 gallon aquarium as a minimum (75 or larger preferred). This will provide adequate walking area as well as swimming area, in addition to assisting the filtration in maintaining good water quality. For additional Rhinoclemmys pulcherrima manni, I would recommend adding 50 gallons of tank space per additional turtle at a minimum, opting for the long versions of the aquarium as opposed to the high or "show" models. Stock Tanks and Rubbermaid containers work extremely well for this species of turtle. The same space recommendations remain roughly the same, however, they require more space for walking, so height is not a requirement, permitting they can not escape. In captivity, they do well on Mazuri, veggies, fruits, plants, crickets and occasional worms and insects. Unlike other semi-aquatics, Rhinoclemmys pulcherrima manni can be fed either on land or in the water. Rhinoclemmys pulcherrima manni make great turtles for community set-ups, as long as the other turtles in the community are both from the same region, but also have the same habitat requirements. These turtles are well-tempered and very sociable as well as intelligent. 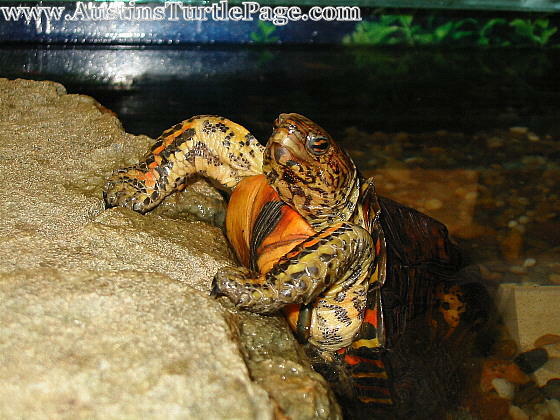 They are extremely personable turtles and can be easily hand-fed.